My friend Clive had challenged me to the ton, so with a rip-roaring tail wind, flat flat flat western Polish countryside and an early start from my Wroclaw youth hostel this morning, it was a doddle. The real challenge of course is being able to do a daily one hundred regularly, whatever the weather and terrain. 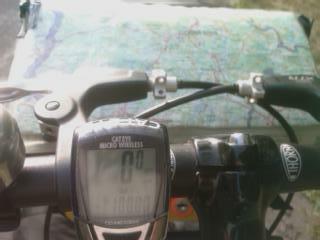 But I'm afraid those days have gone for me, and I'll probably now settle back into my usual daily quota of 70/80 miles (not bad, really) as I trundle on to and beyond Berlin, expecting to get there now on Saturday. I hadn't thought I'd make 100 today, in fact, as I found myself enforcedly idling for rather too long as I waited for a VERY leisurely ferry across the Odra (Oder in German) river west of Wroclaw. The picture above is of the one I just missed, reaching the other side of the river. Where it stayed for nearly an hour as cars piled up on each bank and the boatmen fished (literally) and drank coffee. But it was good to sit quietly, contemplate what this journey has meant for me (perhaps a later blog when it's all settled a bit further) and watch the house martins wheeling, chattering and playing low over the very fast-flowing river, the occasional stork circling overhead, a cuckoo calling in the woods… There's still a lot of unspoilt nature in Poland. Just as there's a lot of history. Set in huge forests and copious wetland, the small towns I travelled through today were solidly German until 1945, and many were destroyed as the Red Army fought its way through here to Berlin. Glogow, Glogau in German, is one of them, still partly in ruins but now being reconstructed. 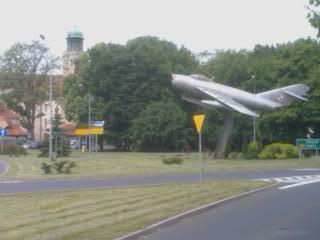 Those are the town hall spires in the background with what I think is an 1950s vintage Soviet-built MIG-15 of the Polish airforce on the right. I suppose putting rusty old fighters on display in this way was once a politically useful alternative to melting them down, though it's strange the post-Commmunist Poles want to keep this eyesore. Re history, tonight with my tent I'm being hosted by a Polish family who were among tens of thousands of Poles forcibly resettled here from Ukraine at the end of the War, to take the place of the banished Germans. And the reference in the title today to Older and Nicer? Not just what I'm going to be when I get home, but a charming misspelling/misunderstanding by one BBC listener writing in some years ago to comment on Germany's Cold War debate whether it should recognise as final the country's Eastern borders laid down at the end of the war. 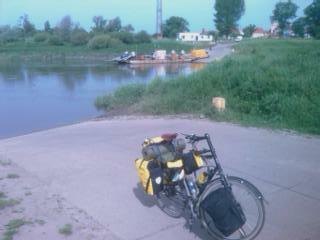 They run, between Poland and then East Germany, along the Oder (Odra in Polish) and Neisse rivers. A border known in the jargon of the day as the Oder-Neisse line. Older and Nicer. We did laugh when that one came in.